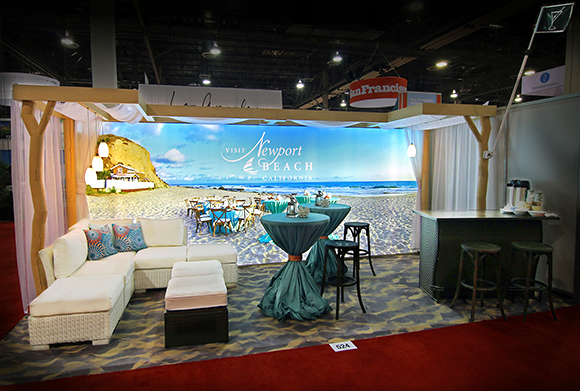 Late last fall at IMEX, America’s worldwide exhibition for incentive travel, meetings and events, Visit Newport Beach Inc. unveiled their experiential-concept tradeshow booth to the meetings industry. The booth brought the ultimate beachside experience to meeting planner attendees, capturing the ambiance that groups might enjoy when attending a meeting in Newport Beach, California. As Visit Newport Beach Inc. continues to make headway in national markets, increasing RFP opportunities and group room nights, the Conference Sales Team determined IMEX would be the ideal opportunity to debut the new booth to existing and potential clients. “IMEX is a large, high-impact show, and the perfect place to establish a strong brand presence for Newport Beach,” says Michelle Donahue, senior vice president of sales. Taking cues from Newport Beach’s coastal luxury roots, the company’s booth depicted a seaside party that meeting planners could envision hosting for their clients. The almost three-dimensional quality of the space allowed meeting planners to feel as if they were actually stepping onto the sands of Newport Beach. The team opted to avoid the more commonly-used square metal frame approach and focused on a booth flooded with texture, light, color and dimension, capturing the essence of warm and welcoming Newport Beach. The lit background image of the booth, styled by key Visit Newport Beach Inc. destination management company partner, Destination Concepts, Inc., is a panoramic vision of a beautifully dressed beachside event set-up, with turquoise highboys and dining tables on the sands of pristine Crystal Cove beach. The coastal event continues in the booth itself with matching highboys from the photo backdrop and comfortable chaise lounge seating, which transported meeting planner attendees from the convention floor, to an entertaining event on the shores of Newport Beach. Additionally, a gorgeous bar with a hoisted martini flag, in the corner of the booth beckons clients to come in for a fresh citrus martini. This pays homage to the area’s beloved local tradition of raising the Martini Flag at 5pm everyday to kick-off happy hour, a custom that has been practiced by residents from the historic area since the 1940’s. Lastly, the carpet of the booth is a sandy beach print, which is an actual photo from the real sand at Crystal Cove beach, captured by drone. Since Newport Beach, Calif. is an ideal destination for mixing business, pleasure and cocktails, IMEX attendees were invited to the booth celebration, where event solutions flow as freely as the hosted libations! Experience the Visit Newport Beach Inc. tradeshow booth at upcoming 2015 tradeshows Global Pharmaceutical & Medical Meetings Summit in Philadelphia, PA in February, Meetings Industry Council in Denver, CO in March and DMAI “Destination Showcase” in March.